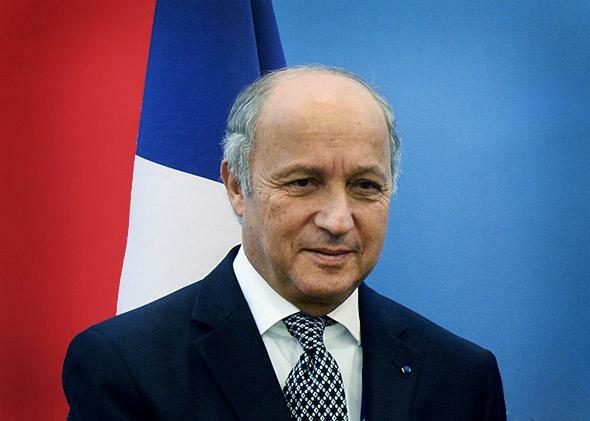 Laurent Fabius interview: The French foreign minister on Ukraine, Syria, and Iran. An interview with French Foreign Minister Laurent Fabius. Photo-illustration by Juliana Jiménez Jaramillo. Photo by Roman Yandolin/Host Photo Agency/Getty Images. What do you think of Russian President Vladi­mir Putin’s recent statements about pulling his troops back from the border of Ukraine? I spoke with [Russian Foreign] Minister [Sergei] Lavrov. He said that they have decided to get away from the frontier but to maintain the number [of troops]. The most interesting thing President Putin said is that he will ask to postpone the so-called referendum [to be held Sunday in eastern Ukraine on declaring independence]. And that he sort of accepts the presidential election to be held on the 25th of May. For us, the main thing is the presidential election. There is no legitimate president in Ukraine, therefore you have to have an election. And this election must take place on May 25. What about further sanctions on Moscow? It will depend on the question of the elections. If actions are taken to make them impossible or to try and delegitimize them, we shall have to increase sanctions. On the contrary, if efforts are made in that direction, there is no reason [to] enhance [sanctions]. Officials in Ukraine feel that the Russian strategy is to prevent the election from taking place. There is a big contradiction, and I insist on it when I discuss it with the Russians. The Russians are saying the executives in Ukraine are not legitimate. Therefore, how can they act in such a way? If you want to have a legitimate power, you have to favor the election. Second, what about the election in Syria? It is a mockery, a tragedy. Everybody knows who will be the winner. The opposition is not authorized to run. There have been 150,000 killed. And Russia is supporting it. The United States is saying it does not see movement of the troops back from Ukraine’s borders. The statement of Putin was not very clear about it. This morning Lavrov said yes, there has been a move. I think we are checking that. Lavrov made a statement a few days ago … and he asked how an election could be held in an occupied country. He said the opposite of what Putin said. I think in the Russian system, the main thing is what is said by Mr. Putin. Many believe that Putin is unstoppable. He’s taken Crimea. And he’s taking town after town in the east and south of Ukraine. It is difficult to know exactly what he has in mind. But we have to be clear about what we have in mind. It is clear that the annexation of Crimea is unacceptable. You cannot accept that one country annexes another. As far as the rest of Ukraine is concerned, we have to support the Ukrainian government in asking for an election. … We cannot accept the annexation or the fact that Ukraine would be controlled or invaded. On the other hand, we should not go to war with Russia. In between, you have diplomacy and sanctions to exert pressure. In the United States, officials are discussing putting sectoral sanctions on Russia. They are also saying France is selling Mistral helicopter ships to Russia. Would you consider not going through with that sale? Many people have commercial interests with Russia. As far as this case is concerned, the decision by the government will be taken in October. You have pointed out that many European countries are very dependent on Russian gas, which makes it hard for them to endorse sectoral sanctions on Russia. It is not easy. But look at Iran. It is a means, which can be efficient. You had a strong position on the Iranian nuclear program during the talks. You walked out during the first round of talks on the interim agreement. How do you see the situation now? I hope we can find a solution. Everybody would be happy with a situation in which there was no longer a nuclear menace. But our position is simple: Civil nuclear energy, yes. Atomic bomb, no. It is very clear. Referring back to the negotiations we had, my position was to say we want to have an agreement, but it has to be a solid one. At a preliminary stage, it wasn’t solid enough. So we had discussions—the P5+1. We decided on a common position. The Iranians said no in the first round. Then 10 days later, they turned around and said OK. So you toughened up the interim agreement? I must add that up to now, the difficulties we have with Russia in Ukraine have had no impact on the [nuclear] negotiation. Didn’t the Iranians insist on a sentence saying they have the right to enrich? We did not accept this wording in the first phase. There can be some enrichment, provided it is limited and not used for military purposes. The Obama administration is pushing for a final deal with Iran by July, right? The end of July. But it can be postponed for six months. Obviously if we can reach a solution, it will be excellent. When President Obama said he would take action if Syria’s Bashar al-Assad crossed the red line and used chemical weapons on his own people, your government agreed to take military action with the United States. Your pilots were being briefed when Obama called off the strike. This was very embarrassing for President Hollande and your government. Among the horrors committed by Bashar al-Assad, there was the use of chemical weapons. We were the first to raise this issue because we had elements showing they were used. After a while, more people were convinced, and eventually it was clear to our British and American friends that chemical weapons had been used. Therefore, we were ready to react and to have some military action. There was a preparation with different countries. The British prime minister asked his Parliament for authorization to act, and it was refused. Then President Obama decided to act in a different way, and it was not possible for us to act by ourselves. After that, the Russians changed their mind and said OK, we shall try to convince the Syrians to get rid of these chemical weapons. Therefore, the Syrian regime accepted to get rid of them. And it is true and positive that step by step, they got rid of them. Today, the work is about 90 percent done. Provided that they did not hide anything from us. But we keep on considering that Bashar—who is a criminal and, according to [U.N. Secretary General] Ban Ki-moon, has committed crimes against humanity—cannot be the future of his people. Neither can terrorist groups like al-Qaida. The reason we are supporting the moderate opposition is they are moderate. We must support them to find a political solution, not with Assad but with some members of the regime. Do you think the West should arm the moderate opposition? We are helping them. But so far as the European countries are concerned, we have taken a decision to not provide lethal weapons. How can they win without lethal weapons? There are [weapons coming] from Saudi Arabia and Qatar. The difficulty is to be sure that these weapons do not get into hostile hands. That is why it is so important to enhance the moderate opposition. If they are stronger, we can be sure that moderate principles will be complied with. Don’t forget that [the crisis in Syria] has terrible consequences on the surrounding countries. Yes, Jordan has over 1 million refugees. Turkey nearly 1 million. Lebanon—a quarter of the population. And the U.N. Security Council has unfortunately been completely paralyzed. Russia mainly. We have new elements—not yet proof—showing that some chemical weapons have been recently used. Recently used. We are looking for proof. We have some hints, but they have to be checked from a scientific viewpoint. So Assad is still doing the same thing? It is on a smaller scale. But there are hints in that direction. Some feel that the failure of the United States to act last year when Assad crossed the red line has had consequences around the world—that people no longer trust the United States. Do you feel that way? Do you think it emboldened Putin? There does exist in the American public a sort of war fatigue. As far as the U.S. is concerned, when there were interventions by the U.S., people were criticizing them. When there are none, people are criticizing. It is true that in this very dangerous world, you have to be strong. Ukrainian leaders believe that Putin assessed the leaders of the free world and believed that he was the strongest. He saw nobody standing in his way. It is true that our democratic systems do not work exactly as the autocratic ones. France has sent planes on a rotational basis to the Baltics. Will Putin attack the Baltic states? It is different because it is covered by NATO. I was in Moldova and Georgia two weeks ago, and obviously they are afraid. Will you become involved in Nigeria? We have proposed to President Goodluck Jonathan to send a team, and they are leaving tomorrow in order to examine what we can do so far as the search of these poor [kidnapped] girls is concerned. We said to [the Nigerian government] that we are available—particularly our intelligence—to help them. It is a region we have known for a long time. How do you feel about the Israeli-Palestinian talks? Is the Obama administration pushing too hard? They have been quite right to push hard. Unfortunately until now there has been no result. We have to try again. There is no other reasonable solution than negotiations and the two-state solution. I’m very concerned about the decision taken to stop the negotiations. There are French radicals fighting in Syria. Do you worry about that? Yes. It is unfortunately rather easy to go to Syria—you can go through Turkey. They are recruiting them through the Internet. We have taken a new decision in order to prevent them from going, to control them, to help their families. … But it’s serious risk. There’s a country that is very risky, and that is Libya. We pay great attention to what is taking place in Libya because it has not to become a hub for terrorist groups. After the overthrow of Qaddafi, there was not enough follow-up. There is no real state in Libya. There are a lot of weapons. You travel to China frequently. Do you think there will be a war in the East China Sea? There are tensions. We recently had [China’s] President Xi Jinping visit here, and last week we had [Japanese] Prime Minister [Shinzo] Abe. We don’t have to interfere, but we have to try and help them cool down the tensions. It is a decisive region. We have to avoid any incidents. It seems astonishing that Russia was able to take Crimea and seems able to also take the east and south of Ukraine with really nobody in the West doing anything. Is it reminiscent of the beginning of World War II—the land grab? When you say doing nothing, that’s not true. But what is true is that when you are looking at history, there can be incidents that become out of control. When you have different populations who are encouraged to take extreme positions, then a situation can come when nobody is in control. That’s the main danger.